After all, Becca, who’s 17, shows no signs of disability. She has no cane, no wheelchair, no walker. She’s an attractive teenager, alert, engaging and vivacious. But Mike is there for a reason: Becca lives with lupus, an autoimmune disorder that attacks the body’s organs. In her case, that meant heart surgery at 12. When Becca was 15, her doctors suggested that the family look into getting her a service dog to alert her to irregularities in her heartbeat. One of Becca’s doctors suggested a Greyhound, and Becca agreed. However, her parents – her father, Michael, is a pickup and delivery driver (and an ordained minister); mom Tonya, home-schools Becca – were told that Greyhounds weren’t suited to be service dogs. They weren’t smart enough, they were told. They couldn’t sit still. They couldn’t learn the skills they needed to qualify. 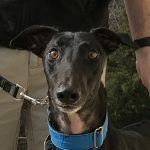 The Harts persisted, however, and Greyhound Friends of North Carolina helped them find Mike, who’s 8 and competed in 17 races in Florida before he retired. He was much older than the Harts wanted, but his adoptive family could no longer care for him and he needed a home. So they proceeded with adopting him. Mike started out as a rescue in the Harts’ three-story Cape Cod-style home. On his first night, he settled with the Harts’ other dogs – Chihuahuas Belle Bleu and Mr. Hollywood and a Yorkie named BeeZee. When Tonya began handing out treats, she told each dog to sit. Mike watched what the others did, and when it came to his turn, obeyed her instantly. That convinced Tonya: Mike was obviously a smart dog and a fast learner: he would be of invaluable assistance to her daughter. 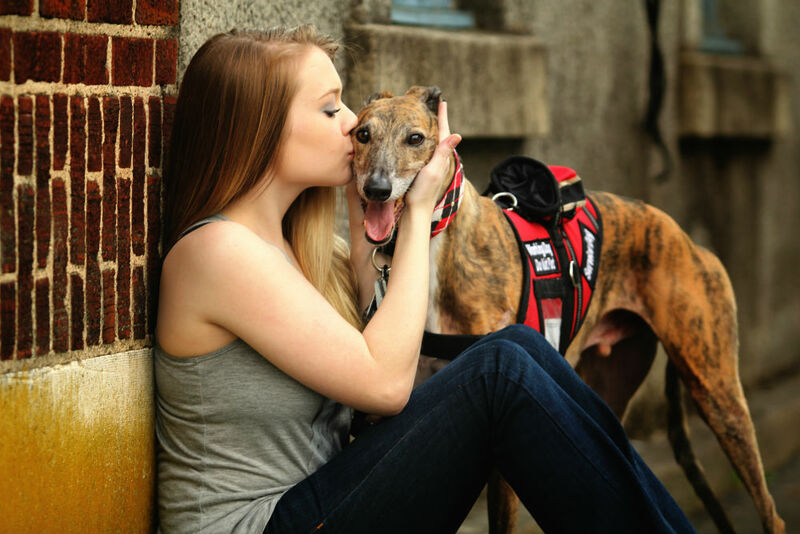 Working with trainer Geralyn Kelly, Mike quickly learned how to be a service dog, becoming the first Greyhound to be certified as a service dog in North Carolina. Mike first showed this incredible intuition when the family was waiting at the hospital for Becca to have tests. Becca began having chest pains; but before she could even express her discomfort, Mike began to signal by stomping his front paws. He can also tell when she’s in pain, and he’ll soon be getting extra training to help with the hearing issues that have recently begun to affect Becca. He’ll learn to listen to traffic for her, alert her by pressing a button that make a light flash if the door bell or the fire alarm sounds and he’s learning some sign language commands. He’ll also be trained to distract Becca when her OCD (obsessive-compulsive disorder), which is common in lupus patients, causes a panic attack. Source: Your Dog Plus, retrieved 2/6/2016.